Revista que por muchos años esta en la preferencia de los modelistas en Mexico, brinda un complemento a la literatura sobre el tema. Con articulos faciles de entender y sin complicaciones, da una excelente referencia al modelista tanto principiante como de nivel medio. Nuevos articulos en el mercado asi como evaluacion de varios de ellos, tips de otros modelistas complementan la informacion en esta util revista. En este numero: Form & Figure: Shades of field gray BY Joe Hudson Two attempts produce one striking German bust Pg. 16 Airbrushing & Finishing: How to dazzle an attack transport BY Aaron Skinner Painting a vintage kit as a veteran remembers his ship Pg. 18 Part 2 of 4: U.S. Navy aircraft identification markings — a history BY Darren Roberts World War II — As color disappears, changes come quickly Pg. 20 Building Curtiss' Beast BY Darren Roberts Academy's 1/72 scale Helldiver is good straight from the box Pg. 26 Special: It came from outer space BY Marcel Du Long Preview of Damaged, FSM's new quarterly publication Pg. 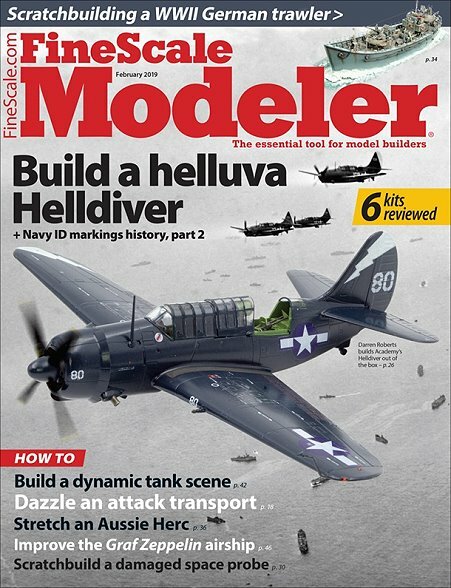 30 Showcase: Scratchbuilding a war trawler BY FSM Staff Angling for a different subject nets a winning model Pg. 34 Stretching a Super Hercules BY Andy Cooper Extending the fuselage for an Australian C-130J-30 Pg. 36 Keeping a Cromwell on track BY James Wechsler Add drama to a small tank scene Pg. 42 Building a queen of the skies BY Phillip Gore Improving Lindberg's 1/245 scale Graf Zeppelin Pg. 46 Final Details: One man's journey BY Mark Savage Sometimes a build becomes something more ... Pg. 66.